This is the amount of money you have to pay to a broker for recommending and carrying out an investment. 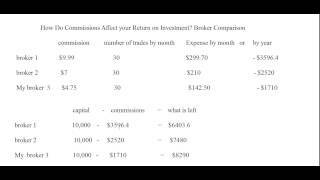 There are some differences between the banks commissions and brokerage commissions. One of them is that banks commissions are higher and offer less services. In addition, there are also differences between the commissions by an online brokerage and a physical brokerage. Each broker must enforce laws that apply in their country but they can choose the commission that they want to receive in return. It is important that this commission is set in competitively because if the commissions are too high, customers will prefer to hire a new broker whose commissions are lower. On the other hand, if the commissions were too low, customers may interpret the work of this broker is not as being as good as another broker. In conclusion, the best choice for a broker to establish the fee will demand is to keep average prices of other brokers. Buying commission and selling commissions. These commissions are considered deductible when you pay income taxes. How do commisiones affect you return on investment?